Katie practices exclusively in family law, to include dissolution of marriage actions, post-decree modification of parental responsibility cases, child support actions, and relocation matters. Katie is also trained in collaborative law. Katie began her training in family law as a student law clerk at Woody Law Firm, LLC and went on to practice family law at Griffiths Law, P.C. before joining McGuane and Hogan, P.C. in 2018. 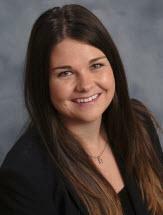 Katie obtained her Juris Doctor from the University of Colorado Law School and holds a B.A. in Psychology with a minor in Legal Studies from Texas Tech University. Katie firmly believes it is the role of the family law attorney to deescalate conflict. However, for those cases that require litigation, Katie is well-prepared to bring the matter to Court. During her time at the University of Colorado Law School, Katie received a Health Law Certificate for her time devoted to the Colorado Health Equity Project, a non-profit organization providing medical and legal services to the underserved population of Colorado. Katie served as a Member and then Resource Editor on the University of Colorado Law Review. In addition, Katie trained in Motions Practice and Advanced Trial Practice under the instruction of Colorado Supreme Court Chief Justice Nancy Rice. Katie is as an active member of the Family Law Section of the Colorado Bar Association and provides pro bono legal services as a volunteer attorney for Metro Volunteer Lawyers. Katie also serves on the Young Professionals Board of Maria Droste Counseling Center and is a volunteer mentor for "Law School Yes We Can." Katie grew up in small ski town Mammoth Lakes in California and enjoys skiing, attending University of Colorado and Denver Bronco football games, and spending time with her goldendoodle, Max.